EXECUTIVE SUMMARY: Scholars disagree as to whether there exists a liberalizing global political order that has been preserved through American hegemony since World War II (often referred to as the “liberal world order”). Still, it is generally agreed upon that the US has been the dominant power in global affairs since at least the fall of the Soviet Union. With the release of the Trump administration’s National Defense Strategy, the US Department of Defense is weighing in on this debate. Specifically, it has announced that American security policy is shifting from counterterrorism in the Middle East to strategizing against rising world powers like China. The reason for this pivot, according to the Pentagon, is the need to protect the current world order from states that seek to revise it. The National Defense Strategy (NDS) was recently released by the US Department of Defense (DOD). It follows the National Security Strategy (NSS) that was released by the White House in December 2017. There are two components to the new release: an 11-page unclassified synopsis that is available to the public, and a much longer (and presumably detailed) report that will remain classified for the foreseeable future. What is a liberal world order? In the field of international relations, the terms “revisionist state” and “status quo state” are used to describe, respectively, countries that seek to change the current international system and those that seek to uphold it. Historians like Robert Kagan argue that ever since the allied victory against Nazi Germany and Japan in World War II, the international system has been maintained by a system of military alliances (e.g., NATO) and global institutions (e.g., the World Bank) that promote the spread of Western liberal democracy. Most importantly, the pillar of that system has been American military and economic strength. This is commonly referred to as the liberal world order. Of course, not all historians agree on the existence of a liberal world order. Niall Ferguson, for example, has argued that the notion of an intentionally liberalizing global system is “historical fantasy” – and one that detracts from the actual era of liberal economic and immigration policies that began when the Soviet Union collapsed between 1989 and 1991. However, what unites scholars like Kagan and Ferguson is their agreement that regardless of how one defines the current international system, the US is undeniably the most powerful country in the world. Indeed, Ferguson classifies the US as an “empire,” albeit one that is reluctant to hold such a title. The NDS agrees with this assessment of overall American military superiority but with the caveat that the US “military advantage has been eroding.” This observation is notably a critique of the policies of the Obama administration. The US has historically intervened in international conflicts at a high cost (see Korea, Vietnam, and Iraq) in order to keep dissatisfied nations from overturning the international system. Under the Obama administration, however, Washington took a brief, but consequential, step back from the job of world order maintenance. This retreat was no accident. In fact, it was the basis of President Barack Obama’s foreign policy. The philosophical underpinning for this policy came from Obama’s favorite quote: “[T]he arc of the moral universe is long, but it bends toward justice.” To Obama, this meant that leaders seeking to revise the international system would ultimately fail, and therefore the US could afford to rely on other nations and “lead from behind.” In other words, history was on the side of the US, so projecting military strength was no longer vital. As a corollary to the “arc of history” argument, the Obama administration naively believed it could help bend that arc by talking to revisionist states and encouraging them to be responsible for the security of their respective regions. The new NDS recognizes this recent shift in the world order with this observation: “We are facing global disorder, characterized by decline in the long-standing rules-based international order.” As such, the new strategy promises a three-tiered approach that prioritizes the “revisionist powers” of China and Russia, then “rogue regimes” like Iran and North Korea, and finally “non-state actors” such as ISIS. Thus, for the first time since the early 2000s, Iran is a secondary area of concern in US security policy. To be sure, since its inception in 1979, the Islamic Republic of Iran has played the role of a “revisionist state,” as it has been responsible for many of the key security issues in the Middle East. Its most recent transgressions include sending advanced missile technology to Hamas that was used against Israel in 2014, openly bolstering Bashar Assad’s repressive rule over Syria by funneling in Iranian special forces and Hezbollah, and backing Houthi rebels who seized power in Yemen in 2015, which sent the country spiraling into civil war. Indeed, Tehran has maintained a steady hand over the region’s sectarian turmoil – especially in Iraq, where its influence over the Shiite government of Haider Abadi has further strained the latter’s relationship with the country’s Sunni population. Adding to this mix is the fact that for decades, Iran has attempted to conceal its pursuit of a widely feared, illegal nuclear weapons program that may very well lead to a future arms race in the Middle East. In sum, Iran can be characterized as a dissatisfied state that is seeking to assert its regional hegemony at the expense of its neighbors’ security. That is why the possibility that the recent protests could open a pathway to real democratic change in Iran is such a tantalizing prospect that it has received bipartisan support in the US foreign policy community. Nevertheless, while the NDS clearly articulates Tehran’s threat to Middle Eastern security, it also implicitly recognizes that Iran is not a world power. Indeed, Tehran is not going to be able to dominate the world militarily any time soon; nor will it figure among the world’s top economies. China, on the other hand, meets those benchmarks – especially in terms of economic power. And while one analyst has predicted that “[b]y 2020, the equipment of the Chinese military will look a lot like the US military in 2000,” there also “hasn’t been much modernization of the US military and there won’t have been by 2020” – meaning the military gap is closing. Thus the new NDS pins the preservation of the current international system on the US strategically responding to Beijing’s long-term ascension – right now. In order to plan for Beijing’s inevitable rise, a forward-thinking foreign policy is vital – something China seems to understand. Indeed, China’s president, Xi Jinping, in a collection of speeches that Beijing published as The Governance of China, has called for a world order in which no single hegemon (read, the US) should serve as a model for the developing nations. Perhaps this is China’s strategy: to claim it does not represent a threat to other nations so that it can gain their trust and business over time. If so, China will continue to get stronger. The problem is there may come a time when China is able to push values onto the rest of the world that are at odds with Western democratic values. Just ask any recent Western visitor to China about their inability to access Facebook and Twitter. China already has a strong economy. It represents almost 15% of the global GDP to America’s roughly 24%. But to put that in a slightly different perspective, China’s economy has grown astronomically in the last decade to overtake Japan as the second-largest global economy. Thus, there is a real possibility that in the near future (likely decades) it could surpass the US and then harness its capital to develop superior military technology. At that point, China would be capable of overthrowing the current international system. The NDS recognizes the principal threat posed by China. It states: “As China continues its economic and military ascendance, asserting power through an all-of-nation long-term strategy, it will continue to pursue a military modernization program that seeks Indo-Pacific regional hegemony.” This is a clear rejection of spheres of influence, which many analysts, myself included, worried would be tolerated by the Trump administration. Indeed, it is clearly stated in the strategy that “Inter-state strategic competition, not terrorism, is now the primary concern in US national security.” Time will tell whether this well-written sentiment gets put into practice. But for now, the DOD is saying all the right things. What’s missing from the NDS is a detailed description of the envisioned role of major US allies like Israel. A portion of it states (with emphasis added): “A more lethal, resilient, and rapidly innovating Joint Force, combined with a robust constellation of allies and partners, will sustain American influence and ensure favorable balances of power that safeguard the free and open international order.” Presumably, here Israel could play a major role in maintaining security in the Middle East vis-à-vis Iran – a scenario that seems more and more likely to be supported by the Sunni Arab states. The new defense strategy leaves even more room for Israel to contribute. In addition to helping the US with “inter-state strategic competition” by checking Iran, Israel can be a major asset in the battle against third-tier, non-state actors like ISIS. Jerusalem has its world-renowned cyber security to contribute, as well as the most sophisticated armed forces in the Middle East. This could free up the US even more to focus on bad state actors like Russia and China – i.e., world order strategy. Populism leans towards shortsightedness. It’s about grievances rather than focusing on the future. Trump is engaging in populist foreign policy when he angrily tweets about something but doesn’t follow up with a constructive alternative. The DOD, on the other hand, is clearly thinking about the future. Some historians assert the existence of cycles of history, which is an argument with renewed meaning now that China is reclaiming its previous spot in world history as a global hegemon. The political scientist Francis Fukuyama, however, had a different take in his famous book, The End of History and the Last Man. He argued that the failure of alternative governance systems to uproot the liberal world order, illustrated by the fall of the Soviet Union at the end of the 20th century, meant that the 21st century would pass with additional peace and prosperity between nations as Western liberal democracy became the norm. In the NDS there is significant emphasis on the fact that Fukuyama’s prediction has not come to pass. 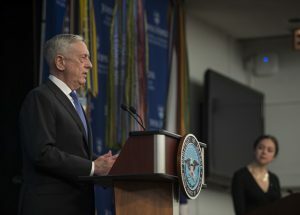 It states: “The central challenge to US prosperity and security is the reemergence of long-term, strategic competition…” Thus the DOD proposes that the US shift its national security discussion from counterterrorism to world order strategy. In all likelihood, the US will not be dominant forever. But given its size, strength, and influence, it should presumably have a shared role in the shaping of any future world order. The preeminent Middle East scholar Bernard Lewis pointed this out when he wrote the following: “There have been dominant civilizations in the past; there will no doubt be others in the future. Western civilization incorporates many previous modernities … It will bequeath a Western cultural legacy to other cultures yet to come.” But for now, it appears that at least the DOD believes America is in the business of world order maintenance, and that fulfilling that role requires masterfully juggling immediate problems like the current Iranian regime with potential world order revisionists like China. After all, as the NDS asserts, the arc of history has proven dangerously unreliable.